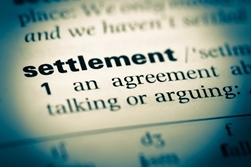 What is a settlement and what are some of the pros and cons of accepting one? A settlement is an official agreement that resolves a personal injury claim or lawsuit before it goes to trial, allowing both parties to avoid the potentially lengthy and somewhat risky litigation process. In the United States, the vast majority of personal injury civil lawsuits never see the inside of a courtroom and are, instead, resolved via a negotiated settlement. During the pre-trial negotiation process, the attorneys for both parties investigate the claim and then take turns making offers, with the goal of eventually reaching a mutually agreeable solution. Settlements award financial compensation for damages, but the settlement agreement may have further stipulations, such as forbidding the plaintiff from pursuing further legal action or disclosing the conditions of the settlement, or requiring the defendant to start or discontinue a specific action or policy. Settlements are awarded to compensate personal injury victims for a variety of damages, including past, current and future medical bills, property damage, lost wages, loss of earning ability, and pain and suffering. When deciding whether accepting an out-of-court settlement is right for you and your personal injury case, there are several pros and cons worth considering. There's no doubt that accepting a settlement can be beneficial for personal injury victims. Accepting a settlement not only spares the plaintiff a lengthy and costly trial, it also guarantees financial compensation for accident-related damages—something that can't be guaranteed if the case is taken all the way to trial. In a courtroom setting, the judge or jury determines whether a financial award is warranted and, if so, how much money is appropriate compensation. Depending on the case, the judge or jury may offer a significant financial award, or nothing at all. Accepting a settlement eliminates the risks associated with a civil trial and ensures that the victim receives compensation for his or her accident-related damages. However, for all its benefits, accepting a settlement can have some downsides. For example, although settlements provide a sure promise of compensation, the amount of money received in a settlement is frequently less than what might have been awarded had the case gone all the way to trial. Additionally, if your situation is desperate and you appear so during the negotiation process, the opposing side may offer you less than what you deserve, in the hopes that you'll take it and just go away. If you can hold out for a better offer, it's almost always in a victim's best interest to do so. If the case goes to trial, what are your chances of winning? What do the verdict and settlement outcomes look like in similar cases? Does your case have any weaknesses? How much does your attorney think you could get in settlement versus at trial? What is the minimum amount you'll accept to resolve the case? If you or someone you love was injured due to another person's negligence, your life may have been turned upside-down in an instant, leaving you wondering if things will ever be the same again. A financial award from the at-fault party can go a long way in helping accident victims get their lives back on track. Call the Morris James Personal Injury Group today to schedule a free consultation to discuss the details of your case, including whether accepting a settlement is right for you.